Don't let the wind blow a good card game! These Magnetic Playing Cards are windproof and are great fun for anytime and anywhere. You can take these Magnetic Card Sets with you on vacation, to the beach, to the pool, or on a cruise. Our Magnetic Playing Card Sets are also a great gift idea for anyone who spends time in bed or in the hospital. These Magnetic Playing Card Sets are available with a quarter fold board or a half fold board, each with one magnetic deck. Refill Magnetic decks are also available. 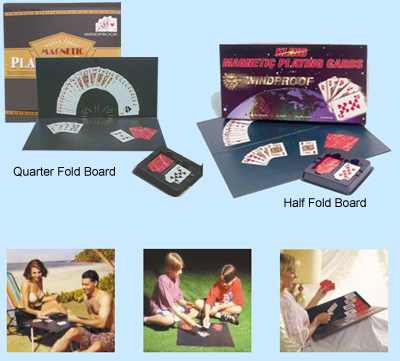 These Magnetic Playing Card Sets are available as a quarter fold board with 1 Magnetic Deck, or a half fold board set with 1 Magnetic Decks. Refill Magnetic decks are also available.